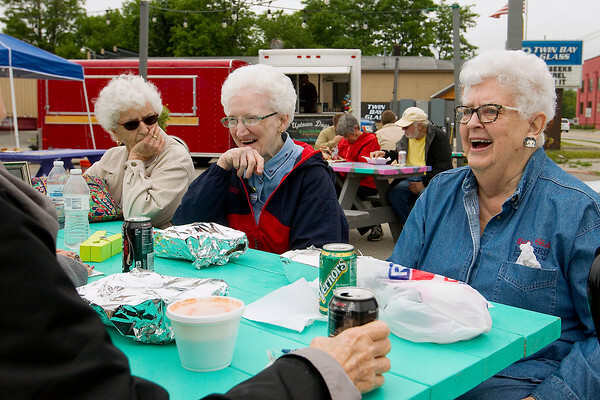 Members of Betty's by the Bay, from left, Betty VanRipper, Betty McTaggart and Betty Harmon laugh with other members of the group during its monthly gathering at the Betty's Hot Dish food truck at The Lot on Eighth Street. The group, which meets on the third Thursday of the month, was started 14 years ago for women named Betty, and visits different restaurants in town for each meeting. "They're not naming kids Betty anymore," said Betty Plough, the group's founder. "I think just because it's just an old name. We just have such a good time in the hour we have together."